This guide is designed to make your auction experience enjoyable and fun, and to help you know what is going on! The registration process is. You give the auction company your personal information and your drivers license number. Then you receive a "Bidder Number". This number is very important and serves several purposes. It identifies the sold item with the buyer (you). Once an item is sold the auctioneer tells the clerk how much an item was sold for and who the bidder was. The Bid card has invaluable information on the back - The Terms of the Sale. The Bid card can be used as a signal to the auctioneer as to your intent to bid. Hold the card up and your "In". We will only raise the bid price when it's your turn so don't be afraid to raise your card. Seating is limited at times so get yours early. We will make announcements, go over the order of the sale and read the Terms of the Sale. This list is also printed on the back of your Bid Card. Up front there is a Ring Man who will watch for bids; a Clerk who enters each item into the auction program; a Runner who hands out the items; and of course, the Auctioneer. When an item is presented the Auctioneer will ask for an opening bid. Example "Would you bid 25.00"? If this is a fair starting bid, raise your bid card. Otherwise the Auctioneer will go to 20.00, or 15.00 or 10.00. Usually someone will jump right in. The Auctioneer will then raise the amount by a standard increment. You may stop bidding at any time, but continue to bid as long as you wish. When the bidding has stopped the Auctioneer will declare the item "SOLD". We will either hand the item(s) to your or leave it on the floor. Either way it is your item, so keep an eye on it. All purchases to be paid in full before leaving the premises. Payment may be made by cash or check. Debit and Credit Cards accepted with a 3% Convenience Fee. Any unpaid amounts will incur interest. Your credit card used for online registration is not automatically charged, unless payment is not received within 2 days. The sale is "AS IS" and "Where IS" and without warranty of any nature whatsoever. Purchasers are deemed to have conducted their own inspection and should NOT rely on descriptive information provided or statements made. By placing a bid, bidder signifies that they have examined the items to their satisfaction, or that they have chosen not to personally examine them. Any dispute with items or prices will only be arbitrated within 2 business days following the auction. No changes to auction invoice regarding item or price will be made on auction day. As soon as you are declared the winning bidder you are responsible for the item purchased. Guard against theft or damage as you will have to pay for these items in full. All titled items will incur a $14 title fee and a $75 document fee for a total of $89. Auto dealers will be charged $40. Loading is the responsibility of the buyer. Make arrangements with staff if items are to be left past auction day. Items left over seven days will be considered abandoned property and no longer belong to buyer. Buyer will incur any cost of disposal. Purchaser will pay all legal state sales tax, unless exemption requirements are met. Purchaser grants a security interest in purchased items. If, for any reason, payment is not made in full, Prime Time has the right to repossess items, even from private property. 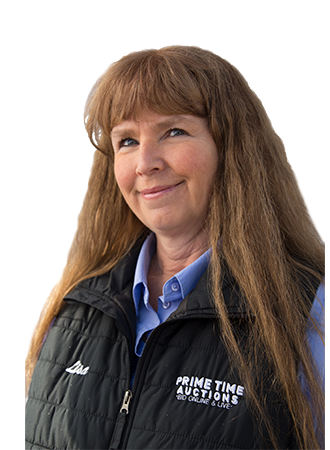 Prime Time Auctions reserves the right to bid on behalf of our sellers and absentee bidders. The vast majority of items are sold to the highest bidder. Through our frequent seller program and special cases, some items have soft reserves. Our best effort is used to create a fair market for our buyers and sellers. If payment is not honored for any reason (including but not limited to N.S.F., stop payment order, or the like) purchaser agrees to pay a return fee. Gun buyers must pass a federal background check. Gun buyers that do not pass a federal background check, will be charged a $50 re-sale fee. If action is necessary to enforce the terms of this agreement, purchaser agrees to pay attorney fees and costs associated with collection or action. All buyer contracts will be subject to the Bannock County legal jurisdiction and the laws in the State of Idaho. Collusion will not be tolerated. In accordance with the Sherman Act, it is unlawful to agree not to bid against another buyer, punishable by fines and imprisonment.